Little Alchemy is a very simple, interesting and light game. The game was released a few years ago, and it is now very popular. Little Alchemy is based on a chemistry ideology, did you notice the ‘chemy’ in Alchemy. In Chemistry, we combine substances together to produce new substance, this is the ideology on which Little Alchemy is based on. In the game, elements are combined to produce new elements, you keep trying out combinations until you have successfully created all the elements in the game. There are two versions of this interesting game: Little Alchemy 1 and Little Alchemy 2. Little Alchemy 2 is an improvement to Little Alchemy 1 — it features a new and nicer interface, there is addition of about 100 new elements. This game is available on a good number of platforms, it is available on Chrome Browser, iOS, Android, Windows and standard web browsers having a Flash player. It is available in 9 languages namely: English, Spanish, Portuguese, German, French, Polish, Dutch, Swedish and Norwegian. On starting the Little Alchemy game on any platform, you will be provided with 4 elements: Air, Earth, Fire and Water. These four elements, Air, Earth, Fire and Water, are known as popular known as fundamental elements and also basic elements. The objective of the player is to created all the elements in the game, starting with the available fundamental elements. When you start playing the game, creating new elements will be easy, but this would not remain the case as the player progresses with the game. As the player progresses with the game, creating new elements becomes a lot more difficult — combinations will rarely create any elements, and sometimes combinations will yield elements the player has created earlier. To get past this stress, a player will need Little Alchemy cheats. However, Little Alchemy cheats are not in form of code or hacking software, they are in the form of cheat sheets (Little Alchemy cheat list). 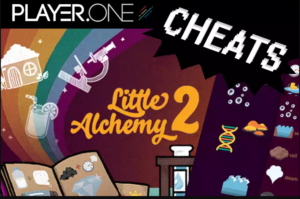 These cheats for little alchemy (cheat sheet) contain elements in the game, and their possible combinations. This means that you can just look at the sheets and start creating new elements with no issues. In this article, I will provide possible combinations of elements, and also indicate the resulting elements of every combination. We’ll discuss the four fundamental elements (Air, Earth, Fire and Water). Air is one of the fundamental elements in the game, in fact, it is the first element. Air has 18 different combinations that will yield different elements. The 18 elements that can be yielded from a combination containing water, include: Pressure, Sky, Pterodactyl, Dust, Bird, Wind, Energy, Stone, Bird, Rust, Atmosphere & Wind, Cloud, Rust, Sand, Rain, Sound, Soap Bubble and Vinegar. The following is a detail of possible combinations of Air: +Air = Pressure; +Cloud = Sky; +Dinosaur = Pterodactyl; +Earth = Dust; +Egg = Bird; +Energy = Wind; +Fire = Energy; +Lava = Stone; +Life = Bird; +Metal = Rust; +Pressure = Atmosphere & Wind; +Steam = Cloudn +Steel = Rust; +Stone = Sand; +Water = Rain; +Wave = Sound; +Soap = Soap Bubble; +Wine = Vinegar. Our next fundamental element is Earth, Earth in combination with other elements can be used to produce about 20 new elements. Some elements that can be yielded from an Air-combination can also be yielded from an Earth-combination. The following elements can be produced by an Earth-combination: Dust, Ostrich, Fog, Grave, Fossil, Pressure, Mountain, Earthquake, Lava, Volcano, Human, Map, Grass, Plant, Horizon, Planet, Geyser, Field, Mud and Earthquake. The following is all elements that can be combined with Earth, and their resulting elements: +Air = Dust; +Bird = Ostrich; +Cloud = Fog; +Coffin = Grave; +Corpse = Grave; +Dinosaur = Fossil; +Earth = Pressure; +Earthquake = Mountain; +Energy = Earthquake; +Fire = Lava; +Lava = Volcano; +Life = Human; +Paper = Map; +Plant = Grass; +Rain = Plant; +Sky = Horizon; +Space = Planet; +Steam = Geyser; +Tool = Field; +Water = Mud; +Wave = Earthquake. Fire is another fundamental element, and it is very resourceful. Fire has over 30 possible combinations that will yield a new element. The following are the elements that can be yielded by a Fire-combination: Energy, Phoenix, Toast, Fire Extinguisher, Pottery & Brick, Bread, Gunpowder, Lava, Omelette, Flamethrower, Explosion, Fireman, Water, Darth Vader, Dragon, Volcano, Brick, Salt, Bacon, Tobacco, Jack-O’-Lantern, Glass, Toast, Salt, Sun, Metal, Caramel, Charcoal, Pumpkin, Steam, Candle, Charcoal & Campfire & Smoke and Oil Lamp. The following is details of Fire-combinations that can yield new elements: +Air = Energy; +Bird = Phoenix; +Bread = Toast; +Carbon Dioxide = Fire Extinguisher; +Clay = Pottery & Brick; +Dough = Bread; +Dust = Gunpowder; +Earth = Lava; +Egg = Omelette; +Gun = Flamethrower; +Gunpowder = Explosion; +Human = Fireman; +Ice = Water; +Jedi = Darth Vader; +Lizard = Dragon; +Mountain = Volcano; +Mud = Brick; +Ocean = Salt; +Pig = Bacon; +Plant = Tobacco; +Pumpkin = Jack-O’-Lantern; +Sand = Glass; +Sandwich = Toast; +Sea = Salt; +Sky = Sun; +Stone = Metal; +Sugar = Caramel; +Tree = Charcoal; +Vegetable = Pumpkin; +Water = Steam; +Wax = Candle; +Wood = Charcoal & Campfire & Smoke; +Oil = Oil Lamp. Water is the last fundamental element, it is also a very resourceful element. Water is a lot more resourceful than Fire, it is also the only fundamental element that can be created. This element can be created by combining Fire and Ice. The following are the elements that can be yielded from a Water-combination: Rain, Seaplane Duck, Soda, Chicken Soup, Rain, Ice, Oasis, Mud, Hard Roe, Steam, Dough, Lemonade, Juice, Pond, Aquarium, Swim Goggles, Dew, Water Gun, Hippo, Obsidian, Tea, Plankton, River, Paint, Water Pipe, Algae, Lake, Paint, Beach, Ocean, Fountain, Steamboat, Narwhal, Sea, Boat, Perfume, Soap Bubble and Waterwheel. The following gives detail of elements that can be combined with water to produce new elements: +Air = Rain; +Airplane = Seaplane; +Bird = Duck; +Carbon Dioxide = Soda;+Chicken = Chicken Soup; +Cloud = Rainn +Cold = Ice; +Desert = Oasis; +Earth = Mud; +Egg = Hard Roe; +Energy = Steam; +Fire = Steam; +Flour = Dough; +Fruit = Lemonade, Juice; +Garden = Pond; +Glass = Aquarium; +Glasses = Swim Goggles; +Grass = Dew; +Gun = Water Gun; +Horse = Hippo; +Lava = Obsidian; +Leaf = Tea; +Life = Plankton; +Mountain = River+Pencil = Paint; +Pipe = Water Pipe; +Plant = Algae; +Pond = Lake; +Rainbow = Paint; +Sand = Beach; +Sea = Ocean; +Statue = Fountain; +Steam Engine = Steamboat; +Unicorn = Narwhal; +Water = Sea; +Wood = Boat; +Flower = Perfume; +Rose = Perfume; +Soap = Soap Bubble; +Wheel = Waterwheel.